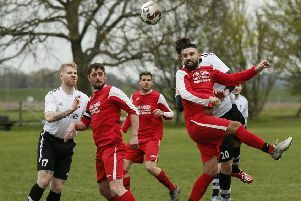 AFC Oakley M&DH’s hopes of going top of the Bedfordshire League were scuppered when their match was called off due to waterlogging on Saturday. With Premier Division supporter by Sportsform leaders Renhold United sitting the afternoon out second place Oakley missed the chance to regain top spot when their scheduled Church Lane encounter with fourth place Wilstead fell victim to the weather. Whilst fifth place Flitwick Town failed to jump above Wilstead after being held to a 1-1 draw at third from bottom of the table Caldecote. Sam Julian scored the home goal against a Town reply via Ritchie Bevan. For Shefford Town & Campton it was their first away win in seven outings with a 3-0 win at second from bottom of the table Eastcotts AFC. Jake Renney, Andrew Hayday and Nick Threadgold scored the goals to do the damage. Whilst bottom of the table Elstow Abbey have now lost their last 15 games after being beaten 3-1 at home by Cranfield United. Harry Ellis gave the Abbey an early lead before strikes from Martin Holland, Jordan Appleton and James Armstrong took United to their sixth consecutive league win and the three points. Meantime over at Bedford Road Recreation Ground Sandy pulled ever further away from the drop zone by beating Pavenham 3-1. It was the visitors who led at half-time via a strike from James Owen before second half goals from Sam Evans, Matt Johnson and Alex Baker won the points for the home side. Elsewhere Sharnbrook are now unbeaten in their last six outings after winning 3-1 at Ickwell & Old Warden. James Burnside scored all three goals against a home own goal in reply. The result now sees the clubs swap tenth and 11th places in the league standings. With leaders Sundon Park Rangers sitting the afternoon out second place Stevington failed to narrow the gap at the head of the standings by getting beat 3-1 at third place Queens Park Crescents who are now within goal difference of them in the league table. Myles Ferraro, Ayaz Hussain and Daniel Rasol were on the scoresheet for the Crescents. Whilst now up into fourth place following defeats for Ickleford and AFC Kempston Town & Bedford College Reserves are Meltis Albion who returned to winning ways with a 2-1 home win over Riseley Sports. Thomas Hughes and Carl Townsend scored the Albion goals against a lone reply via James Law. For now fifth place Ickleford it was a 2-0 home defeat at the hands of Potton Town for whom Chris Moore and James Wills netted the goals. Whilst now sixth place AFC Kempston Town & Bedford College Reserves were beaten 2-1 at Henlow who, with the three points, duly climbed out of the drop zone at the other end of the standings. James Campbell and Dan Wilson were on the home scoresheet against a lone reply from Abdoulaye Dialo. Elsewhere following three straight away defeats Westoning returning to winning ways on the road with a 5-2 victory at now second from bottom of the table Houghton Athletic. Sam Holmes led the way with brace and joined on the scoresheet by Sam Childs, Sam Taylor and Taylor Clayton to bring up the nap hand against home replies from Andrew McMaster and Ali Mohiyaldeen. The final game of the day in this division saw Shefford Town & Campton Reserves win for the first time in six home starts with a 2-1 victory over bottom of the table AFC Oakley M&DH Reserves. Steve Moules and Tim Andrews scored the vital goals against one in reply from Hayden Sohanta for the visitors. With second place Cople & Bedford SA sitting the afternoon out league leaders Cranfield United Reserves are now five points clear after they retained their unbeaten record with a 1-0 home victory over Kempston Hammers Sports thanks to a successful penalty from Ryan Collis. Whilst now up into third spot are Flitwick Town Reserves who made it seven home wins on the bounce with a 7-3 victory over Lea Sports PSG. Scott Gadsden scored four times, David Keefe twice and Sean O’Donnell once against PSG replies from Owen Malcolm, Joe Hennem and Jordan Yearwood. Dropping down into fourth spot are Atletico Europa whose three game winning run was ended when going down to a 3-0 defeat at Clapham Sports who duly maintained their 100% home record. Liam Bolton scored twice and Marko Tobozic once to win the points for the home side. Meantime Bedford United are now unbeaten in their last three home starts after running out 3-2 winners over Wootton Village. Jamaal Dixon netting twice and Tom Wade once against a brace in reply from Jason Churchman-Hall. The Kempston Athletic v Marston Shelton Rovers Reserves game at Cutler Hammer was waterlogged off. There is no change at the head of Division Three following wins for the top two clubs. For league leaders Wixams it was a retention of their 100% home ways with a 7-0 victory over second from bottom of the table Meltis Albion Reserves. Matt O’Connor scored twice alongside single strikes from Gareth White, Gareth Loadman, Jack Perry, Tom Sargent and Danny Lawrence. Whilst second place Sundon Park Rovers were 5-0 home winners over bottom of the table Clifton, Craig Barnes with a hat-trick plus Kane Griffiths and Scott Fraser netting the goals to bring up the nap hand. With third place Caldecote Reserves having their game at Wilstead Reserves waterlogged off, now just two points behind them are AFC Dunton who won 2-1 at White Eagles. Lee Adams and Tony Norman grabbed the vital goals against a lone Eagles reply from Kazimierz Orzechowski. Whilst up into the top six are Renhold United Reserves who ran out 3-1 home winners over Shefford Town & Campton A. Michael France scored all three goals against one in reply from Town’s Michael Castle. League leaders Mid Beds Tigers took another small step towards lifting the league crown by sharing the points in a 2-2 draw at Flitwick Town A, Daniel Whitten netting both of the Tigers goals against home replies from Kevin Higby and Ross Iving. Whilst second place Polonia Bedford still live in hope after running out 8-3 winners at AFC Kempston Town & Bedford College A. Filip Otocki scored four times, Marian Sobczyk three times and Dariusz Slowinski once against home replies via Giovanni Moscaralito twice and Fario Marzai once. Meantime now in third spot and doing their promotion hopes no harm at all are Bedford Albion by winning 3-1 at Stevington Reserves. Jack Brown, Josh Emmerton and Shaun Challi all found the back of the net against a lone home reply from Simon Ellis. The Westoning Reserves v Caldecote A game at Greenfield Road was postponed.